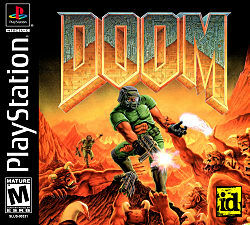 In Doom, a nameless space marine, gets punitively posted to Mars after assaulting a commanding officer, who ordered his unit to fire upon civilians. The Martian marine base acts as security for the Union Aerospace Corporation UAC, a multi-planetary conglomerate, which is performing secret experiments with teleportation by creating gateways between the two moons of Mars, Phobos and Deimos. Suddenly, one of these UAC experiments goes horribly wrong; computer systems on Phobos malfunction, Deimos disappears entirely and "something fragging evil" starts pouring out of the gateways, killing or possessing all UAC personnel! Responding to a frantic distress call from the overrun scientists, the Martian marine unit is quickly sent to Phobos to investigate, where you, the space marine, are left to guard the hangar with only a pistol while the rest of the group proceeds inside to discover their worst nightmare. As you advance further, terrifying screams echo through the vast halls, followed by a disturbing silence ... it seems, all your buddies are dead and you're all on your own now - fight back, exterminate every evil creature and get your ticket back home to earth! On Sunday June 11, Bethesda hosts a third E3 press conference and it promises to be a huge show with some major announcements and few surprises. Hey guys, if you guys have time to spare for an amazing cause, checkout Summer Games Done Quick In July. Please if possible, show them your support by donating or watching it fine too. From the early days of Death Race to Mortal Kombat, video game controversies have come a long way. Just who is Ivy Tenebrae and what is she all about? Let's ask her! The new board game of DOOM is exactly what fans of the game would want. It is almost perfect. Here is what it does right and what it does wrong. Video games have clearly influenced board games, but sometimes this can be the other way around! ThinkGeek has a variety of great gifts for the upcoming holiday season. Don't know what to get? Check this guide out! You're sure to find something neat! Since the release of Free Update 4, DOOM's user count has at least doubled. DOOM's third free patch introduced Deathmatch in hopes of bringing life into it's multiplayer. Just under a month on, the user count remains the same. What better way to celebrate National Video Games Day than to purchase discounted games?